The Montgomery Symphony Association is proud to announce winners of the 2019 Vann Vocal Institute. 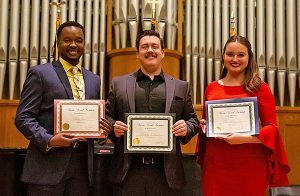 First place went to Baritone Christopher Withrow, the second place winner is Zabriel Rivers, a Counter-Tenor and Soprano Olivia Heaner took third place. We thank all of the participants of the 2019 Vann Vocal Institute as well as our faculty and artist director David Cangelosi. First place winner Baritone Christopher Withrow has been an active performer with Townsend Opera Players, Northstar Opera Company, Modesto Symphony Orchestra, Shasta College, Simpson University, the University of Nevada, Las Vegas Opera Theater and other ensembles in the southwestern region. He is currently pursuing a Doctor of Musical Arts degree at the University of Alabama studying with Paul Houghtaling.